Henry William 'Bill' Wyld, Jr. 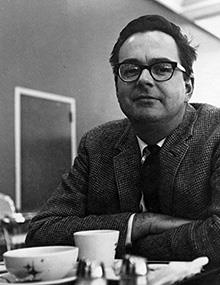 Emeritus Professor of Physics Henry William “Bill” Wyld, Jr., 85, died on Oct. 16, 2013, in Urbana. Wyld was born in Portland, OR, in 1928. He was preceded in death by his wife, Jeanne-Marie Bergheim Wyld, by a daughter, Karen, and a son, Derek. He is survived by a daughter, Sandra, and a grandson. Wyld was a theoretical elementary particle physicist, gifted with an understanding that was imaginative, profound, and clear. His steady leadership, scholarship, and service over the course of 33 years at Physics Illinois proved a great asset to the department. He was well respected in his field for his sound judgment and for his proper, careful treatment of theoretical calculations—colleagues turned to him when they had a particularly bothersome problem or puzzle, whether in research or teaching. Wyld took advantage of supercomputing capabilities as these were being developed to run large-data simulations; he always pushed for more computing power to answer fundamental problems. In his early career, Wyld worked in low- and high-energy physics on weak interactions and several problems related to K-meson proton scattering. Wyld is particularly noted for his significant theoretical contributions related to the effects of the breakdown of quantum mechanical symmetry properties, written shortly after the discovery of parity violation in 1957, that presented detailed calculations of a number of effects to be expected. This work enabled various experimental groups to correlate and evaluate their results. University of California at Berkeley Professor of Physics J. D. Jackson first met Wyld at Princeton in the fall of 1956 and collaborated with him and Sam Treiman in a theoretical investigation of the violation of time reversal symmetry in beta decay, after the discovery of parity symmetry violation in beta decay in December of that year. Wyld also took a strong interested in applications of field theory techniques to statistical mechanics and the many-body problem. Later work focused on the theoretical study of fluid and plasma physics. His theory of turbulence in an incompressible fluid, which involved elaborate mathematical analyses, represents a significant contribution in this area. While on sabbatical leave in 1963/64 at the Theoretical Physics Department at Oxford University on a National Science Foundation Senior Postdoctoral Fellowship, Wyld’s interest in elementary particle physics was rekindled: he studied symmetry violations in baryon-baryon interactions, looking at both strong and weak interactions. On a half-year sabbatical in 1970, Wyld worked at the Theory Division of CERN on a Guggenheim Fellowship, studying the theory and phenomenology of strong interactions in high-energy particle physics, and in particular on the theory of high-energy diffraction scattering and the multiperipheral model. Wyld took advantage of supercomputing capabilities as these were being developed to run large-data simulations; he always pushed for more computing power to answer fundamental problems. On sabbatical Leave in 1983/84, he used the large computing capabilities at Los Alamos National Laboratory to carry out large-scale Monte Carlo computer simulations of quantum chromodynamics on a discrete space-time lattice, concentrating on phase transitions associated with chiral symmetry restoration and quark deconfinement in strongly interacting quark-gluon matter at finite temperatures and high densities. At the time, this work was at the forefront of the nonlinear quantum field theory of elementary particles. Wyld was also a well-loved teacher and mentor. In the 80s, he advocated for strengthening the education of physics students in modern mathematics and was one of a group to reorganize the quantum mechanics graduate course into a unified 3-semester course. Wyld’s book, Mathematical Methods for Physics, first published in 1976 with a 2nd edition in 1999, is a classic that remains relevant and helpful to graduate students of physics today. Wyld was a member of Phi Beta Kappa and Sigma Xi honorary societies. During his tenure, he served on several committees, including the campus’s Computer Allocation Subcommittee Research Board, the College of Engineering Policy and Development Committee, and the College of Engineering’s Engineering/Math Liason Committee. He was a long-time member of the department’s Qualifying Exam Committee, which he chaired for a number of years. He also served as a graduate student advisor. Wyld earned his A.B. in physics in 1949 from Reed College in Portland, OR, where he was a member of Phi Beta Kappa and received a James B. and Mabel B. Kerr Scholarship and an Alfred Greenburg Scholarship. Wyld continued his studies at the University of Chicago, earning his master’s (1951) and doctoral (1954) degrees in physics. Here, studying under Marvin Goldberger and Murray Gell-Mann, he became interested in quantum field theory; his doctoral thesis was a field theoretic study of meson-nucleon scattering, entitled “Fourth order corrections to meson-nucleon scattering in pseudoscalar meson theory,” published in Phys Rev 96, 1661¬1678 (1954). While at UC, Wyld was selected for a William Rainey Harper Fellowship and an Atomic Energy Commission Pre-doctoral Fellowship. In the summer of 1955, Wyld married Jeanne-Marie Bergheim; the couple had met as students at Reed. From 1954 to 1957, Wyld worked as an instructor of physics at Princeton University. He spent the summer of 1956 at Los Alamos National Laboratory working on plasma physics, his first introduction to the subject that would prove a life-long interest. During the summers of 1952–1963, Wyld worked as a consultant at Space Technology Laboratories and Ramo Woodlrige Corp. in Los Angeles, where he provided theoretical work on basic problems in plasma and fluid physics. Wyld joined the faculty at Physics Illinois as an assistant professor in 1957, hired by then Head of Department Wheeler Loomis; he was promoted to associate professor in 1959 and to professor in 1963. From 1968 to 1975, he worked as a consultant for the seismology department at Gulf Oil Company and helped in the early mathematical development of tomography technology for oil exploration . Upon his retirement in 1995, Wyld was conferred the title of emeritus professor of physics.